Dan Sr. is the owner and chief designer of Lakeland Landscaping. He is known for his strong, consistent relations with his clients and his unique ingenuity in the landscape. 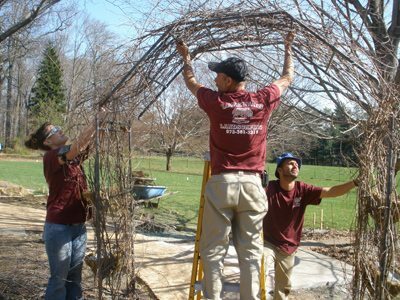 He has over 40 years of construction and horticultural experience in the industry. Dan is a proud father of six children. He enjoys spending time with all of his kids and his wife, Debbie. When he’s not letting his creative mind wander on the drawing board, he likes to let it wander while meandering through back roads on his motorcycle. Dan is a graduate of the University of Delaware with degrees in landscape Horticulture and Plant Biology. He has been working in the family business ever since he was able to push a mower. Today, he is responsible for managing all of Lakeland’s maintenance accounts and daily operations. His job is to keep their landscapes looking the way they were designed and intended to look. He is known for being a passionate, particular, perfectionist with his work, much like his father. He enjoys riding motorcycles, snowmobiling, working on his home and time with his dog Bella. Sharon is a team member and family member. She is the heartbeat of the office at Lakeland. She is responsible for accounts receivable and payable, human relations and the general operations of the office. She is known for her exceptional organizational skills, personality, professionalism and efficiency. Janae is a landscape designer for Lakeland and a certified professional floral designer. Janae has attended Morris County Community College and Rutgers University for landscape architecture. She is known for her exquisite artistic ability in her designs and creative floral displays. Janae custom designs floral gardens, potted planters and indoor silk flowers for our residential and commercial clients. Her hobby and true passion is floral displays and arrangements. Debbie is Dan Sr.’s wife and also helps with the business. She oversees the duties of the office work and is the ever-important moral support behind her husband and son. Her other full time job is raising six kids and a handful of animals. She enjoys reading, time with her dogs and kids, and the nights when she doesn’t have to cook dinner. Gary has been with Lakeland for over 30 Years. His craftsmanship and experience are second to none in the construction field. Gary enjoys working on his home, fishing and time with his kids and grandchild. Steve has been with Lakeland for over 20 Years. He is a phenomenal equipment operator and construction installer. Steve enjoys time with his family and soccer. Ralph has been with Lakeland for over 10 years. Ralph is responsible for keeping our properties looking the way they do. Ralph enjoys time with his wife and daughter and riding his quad. Alex has been with Lakeland for over 10 years. He is responsible for our plantings, pruning and enhancement work. His plant knowledge is superb. He enjoys time with his wife and daughter and working on his farm. Bella is the mascot for Lakeland Landscaping. She is in charge of greeting all the employees each morning and putting a smile on everyone’s face. She likes to receive treats of all kinds and enjoys riding in the truck and going to the jobsite and supervising.